The global high temperature elastomers market is expected to generate revenue of USD 16.8 billion by 2024 and is further anticipated to witness CAGR of 7.2% during the forecast period. Elastomers posses elastic and viscosity properties and are considered to be a bundle of polymers. The high temperature elastomers that comprises of properties such as chemical, corrosion and thermal resistance among others are known as thermosetting elastomers. These thermosetting elastomers are extensively being used in many industries such as electronics, transportation, building & construction, oil& gas and electrical. Moreover, increasing urbanization and industrialization in emerging economies is expected to further bolster the growth of global high temperature elastomers market. The rampant demand from transportation mainly pertaining to aircrafts and automobile industry is further anticipated to contribute effectively towards the growth of global high temperature elastomers market. 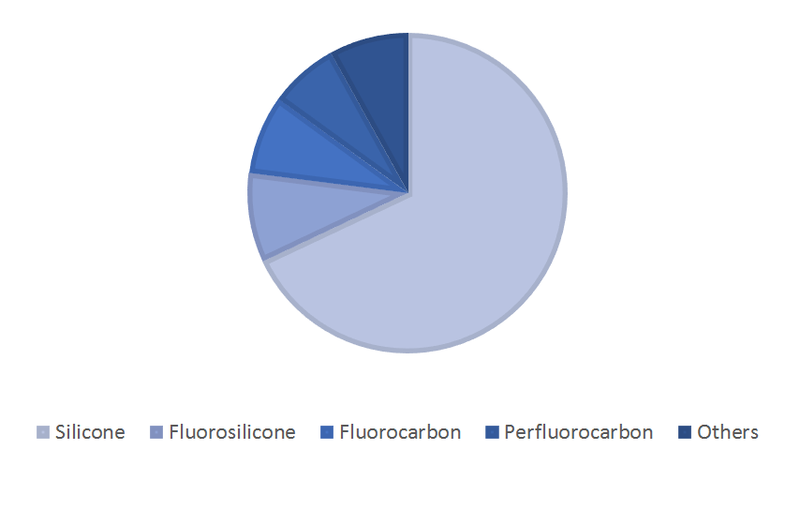 On the basis of type, the global high temperature elastomers market is segmented into fluorocarbon, silicone, perfluoroelastomers, fluorosilicone and others. Others segment can be further sub segmented as polyacrylate and nitrile. Among all these segments silicone elastomers is projected to generate largest revenue of USD 11.5 billion by 2024. The increasing market revenue of this segment is attributed towards huge demand for silicone elastomers from the automobile and construction industries that are particularly driving the growth of global high temperature elastomers market. For instance in automotive industry, silicone elastomers are used as vibration dampers and in construction domain these elastomers are used as a sealant material. On the basis of application, global high temperature elastomers market is segmented into semiconductor & electronics, automobile & transportation, industrial machinery, consumer products, healthcare and others. Automobile and transportation was the largest application area in the market, contributing more than 50.0% revenue in 2017. The automobile industry are constantly utilizing high temperature elastomers in their business operations as it helps the manufacturers in producing other machinery parts of this domain along with under the hood modules. Rapid increase of automotive industry along with extensive utilization of high temperature elastomers is majorly driving the growth of global high temperature elastomers market. The automotive industry in developing economies such as Latin America and Asia-Pacific are observing significant growth due to rapid growth in high temperature elastomers market. These elastomers serve various beneficial properties such as flexibility, durability and resistance to automotive lubricants and excessive heat. Moreover, high temperature elastomers are extensively being used in various other industries as well such as oil & gas, electrical, transport, aerospace and healthcare. For instance, these elastomers are excessively being utilized in manufacturing of seat covers, specialty rubber and tires in the automobile domain. Along with this these elastomers are expansively being used as additives in other industries such as consumer goods, electronics and healthcare. As a result, due to all these additive properties of these elastomers the global high temperature elastomers market is expanding at rapid pace. The installation of high capital oriented manufacturing unit along with higher production cost of the elastomers as compared to that of ordinary elastomers is the major factor hindering the growth of global high temperature elastomers market. Ordinary elastomers are comparatively more cost effective, although they do not perform preferably in high temperature and performs functions in an effective manner. Moreover, the cost associated with components developed from high performance modules is higher than another elastomer as result high temperature elastomer market is expected to observe hindrance in its growth in the near future. Globally industry players of global high temperature elastomers market are leveraging market growth through increasing investment on research and development in advanced elastomers. Technological upgradation and advancements are thereby enabling the key industry players in automobile industries and other industries to perform functioning in more effective and efficient manner. Geographically, Asia Pacific is expected to witness fastest growth in the global high temperature elastomers market due to rampant economic development and fuelling growth in construction industry. The high temperature elastomers market in Asia-Pacific is further anticipated to generate largest revenue of USD 6.6 billion by 2024 owing to large number of organizations in automobile domain. Moreover, increasing investment avenues in technological advancements along with utilization of these elastomers in oil & gas and other industries in several countries such as Saudi Arabia, Morocco, UAE, and Dubai and in Middle East and Africa have further bolstered the growth of global high temperature elastomers market. Additionally, rampant growth of these elastomers in the consumer goods, healthcare, automobile and manufacturing domain in South American countries are pertaining towards the growth of this market. Some of the major players operating in the global high temperature elastomers market include KCC Corporation, Dow Corning Corporation, Momentive Performance Materials Inc., Wacker Chemie AG, Solvay S.A., Daikin Industries, Ltd., 3M Company, RTP Company, The Chemours Company, and Shin-Etsu Chemical Co., Ltd.
10.10. Shin-Etsu Chemical Co., Ltd.
Table 66 Snapshot - Momentive Performance Materials Inc.
Table 68 Snapshot - Solvay S.A.
Table 69 Snapshot - Daikin Industries, Ltd.
Table 73 Snapshot - Shin-Etsu Chemical Co., Ltd.